ROCHESTER – January 12, 2018 – It’s a frigid Saturday morning as the vendors set up their stalls and the first visitors arrive at the City of Rochester Public Market. Assistant Market Supervisor Evan Lowenstein is getting ready for another hectic shift at the City’s thriving outdoor marketplace. A native of Upstate New York, Evan and his family moved to Rochester in the late 90s. He has a background in urban planning and community development, and he got what he calls the perfect job to share his passion for the community. Evan’s love of the Market is contagious. In his position, Evan is in charge of communications and marketing, coordinating special events, and working with community groups on special elements and programming at the Market. He also assists with the day to day administration and management of the Market, as well as the short and long term planning for this Rochester institution. Evan is especially proud of the Market’s Token Program for SNAP recipients, which makes it easy for those recipients to get healthy, fresh, affordable food. This program generated over $1 million in local commerce last year alone. “I’m very proud of our SNAP program here. It’s the gold standard nationwide,” he explained. “We’ve got a good thing going here,” he confidently nodded. 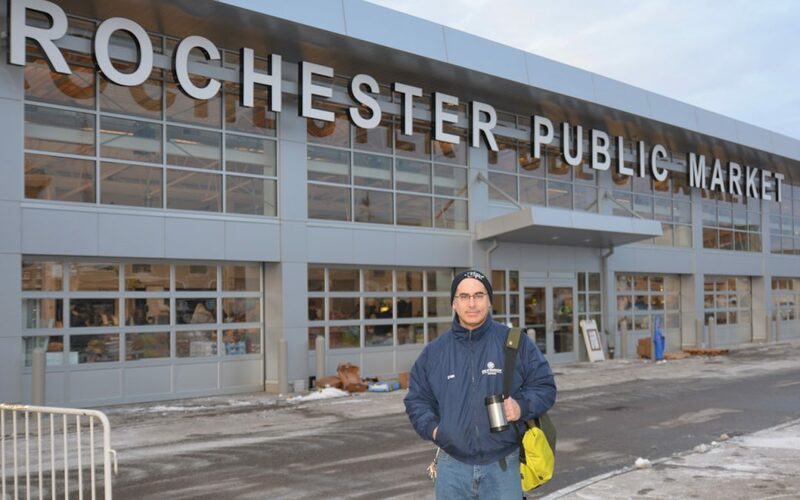 Because of dedicated public service workers like Evan Lowenstein, the Public Market remains the beating heart of Rochester’s urban landscape.